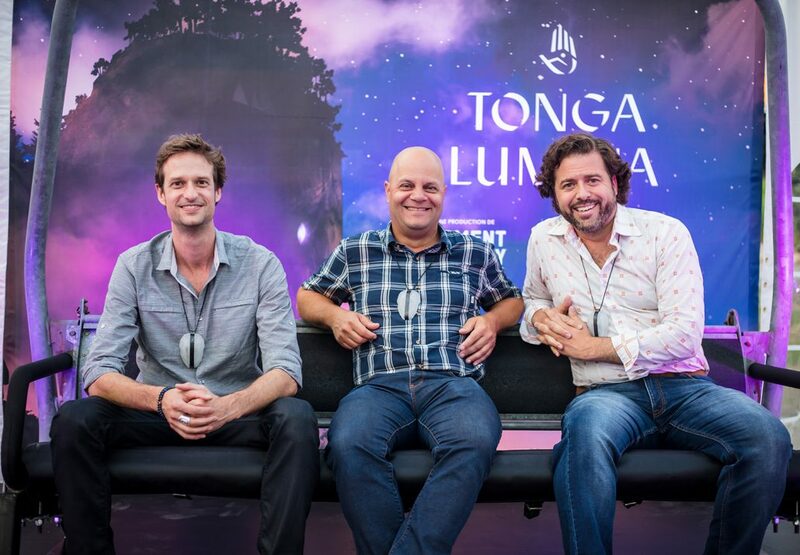 Last night at Tremblant was the Tonga Lumina pre-launch, a unique Moment Factory creation. 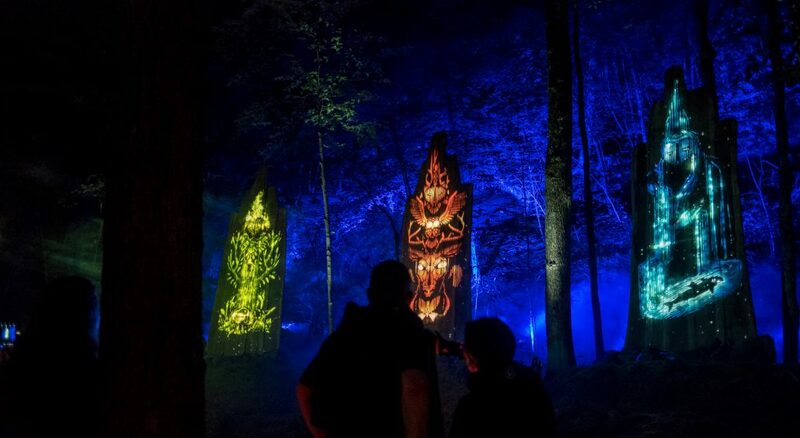 Both global leaders, the pair of Québec giants joined their savoir faire to develop an immersive, interactive and illuminated night walk that begins with a ride on the Flying Mile lift and from the mid-way station, plunges spectators into a universe that showcases the mountain’s natural elements. “It was a genuine pleasure working with Station Mont Tremblant’s team, creating a new immersive multimedia experience for the region’s visitors and residents. 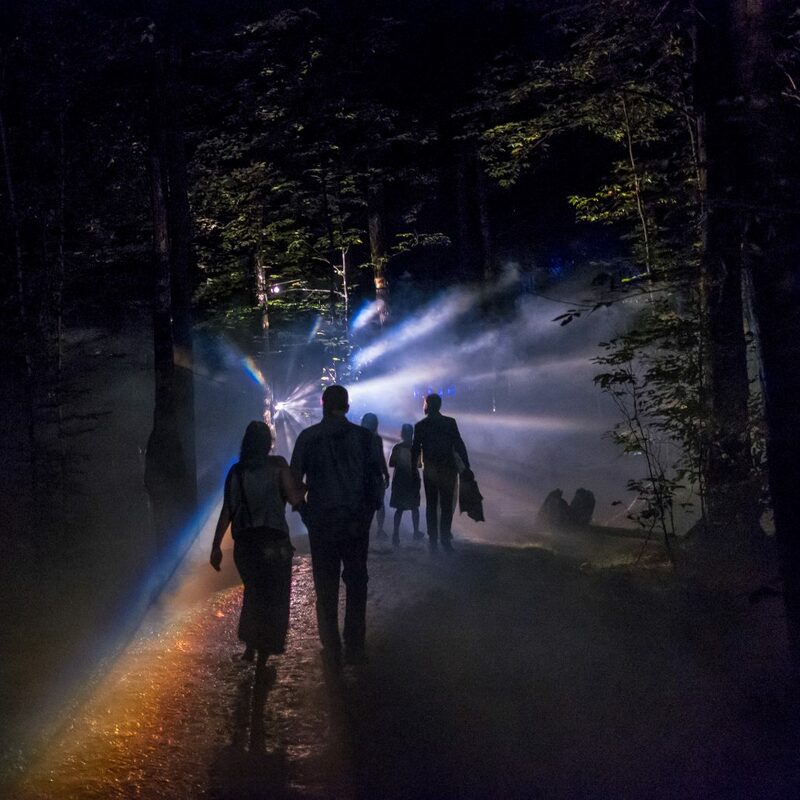 Inspired by Mont Tremblant and its legends, Tonga Lumina is our latest night walk that invites visitors to rediscover this magnificent site at night, and enjoy a different type of adventure in nature,” explained Moment Factory producer Jonathan St-Onge. Legend has it that a sleeping giant calls Mont Tremblant home, and that upon each of his awakenings, his descendants would return to this sacred land to seek out his ancient wisdom. Now in our modern times, as the forest is cloaked in shades of green, the giant beckons to us as well. Donning the amulet of the forgotten people, curious, observant spirits follow a mysterious path deep into the heart of the mountain, to discover the secret he wishes to share. Average duration one hour, or according to the pace of participants. Tickets are on sale at tongalumina.ca for $26.99 per adult, $16.99 for teens ages 13 to 17, and $10.99 for kids ages 6 to 12. Admission is free for children 5 and under. Moment Factory is a multimedia entertainment studio offering a full range of production expertise under one roof. Our team combines specialization in video, lighting, architecture, sound and special effects to create remarkable experiences. Since its inception in 2001, Moment Factory has created more than 400 unique shows and destinations. Productions span the globe and include clients such as the Los Angeles International Airport, Nine Inch Nails, Microsoft, the NFL, Sony, Toyota, la Sagrada Familia in Barcelona, Madonna and Royal Caribbean.